Kepu is another youngster emerging for the Wallabies in the current transitional phase. 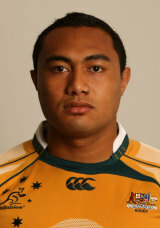 A representative for New Zealand at junior levels, Kepu was born in Sydney and debuted for Australia against Italy in 2008. The prop was in the wider Chiefs squad in Super Rugby between 2005 and 2007, before the Waratahs threw him a lifeline for the 2008 Super 14 season. He excelled for the NSW side and for Sydney club Randwick, catching the eye of Wallabies selectors with his power and ability to crash over for the odd try. After impressing throughout the 2011 Super Rugby season - Kepu pushed into reckoning for a Wallabies first-team spot at loose-head following an injury to usual first-choice Benn Robinson. Kepu kept his place in the front-row and started throughout the Tri-Nations. He went on to make six appearances for the Wallabies in the World Cup.